Instant Pot Banh Mi is a Vietnamese Pork Sandwich that has an explosion of flavors. This Asian sandwich is assembled on a toasted French baguette with pork, pickled vegetables, pate, fresh herbs and condiments. Bring the flavors of your favorite banh mi food truck or takeout to your kitchen with this easy recipe. Bahn mi has really grown in popularity with the onset of the food truck phenomenon in the US. I was introduced to banh mi when I visited a neighborhood Vietnamese restaurant and I was hooked from the first bite! It really is one of the most delicious sandwiches I’ve ever had. My daughter’s best friend is Vietnamese and she told us that saying ‘banh mi sandwich’ is like saying ‘sandwich sandwich’ or it could be ‘bread sandwich’. I had no idea! (Umm, kinda like when people say ‘chai tea’. ‘Chai’ is ‘tea’ in Hindi!) So we’ll just refer to it as ‘banh mi’, shall we? So what is a banh mi? Bahn mi is a sandwich that originated in Vietnam, following the introduction of French bread by the French colonists. If you’re interested, find out more about the history of banh mi, particularly in the US. The best part about this Instant Pot banh mi is the explosion of flavors (sweet, sour, spicy, salty, savory) and different textures (crispy, crunchy, chewy, airy). Bahn mi is made from toasted baguette, pâté, mayonnaise, pickled daikon radish and carrots, sliced green chili peppers, cilantro leaves, Maggi sauce, and pork. 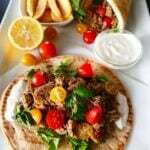 These ingredients contribute contrasting flavors and textures, that when put together, make for an awesome sandwich. My Instant Pot Banh Mi recipe is adapted from a grilled pork banh mi recipe that I make. Because it’s pressure cooked in the Instant Pot, I adapted the recipe to shred the meat and increase the spices. Pâté (pronounced ‘pah-tay’) is a meat spread that can be kind of expensive and/or may not be available to you. If your pâté is not spreadable, slice it thinly. If you don’t want to use pâté, substitute a slice of ham. But you will be missing the rich flavor of the pâté. Try to find a light crusty baguette – avoid a dense, chewy bread. If you have a Vietnamese bakery near you, all the better! Bolillo rolls, Cubano rolls, or hoagie rolls also work well. And don’t skip toasting the bread; I find that the Instant Pot banh mi is so much more flavorful with a toasted baguette. Maggi sauce is a soy-based sauce that’s made with different recipes depending on the country it’s sold in. You can find many of them on amazon. It’s one of the ingredients in an authentic, traditional banh mi. 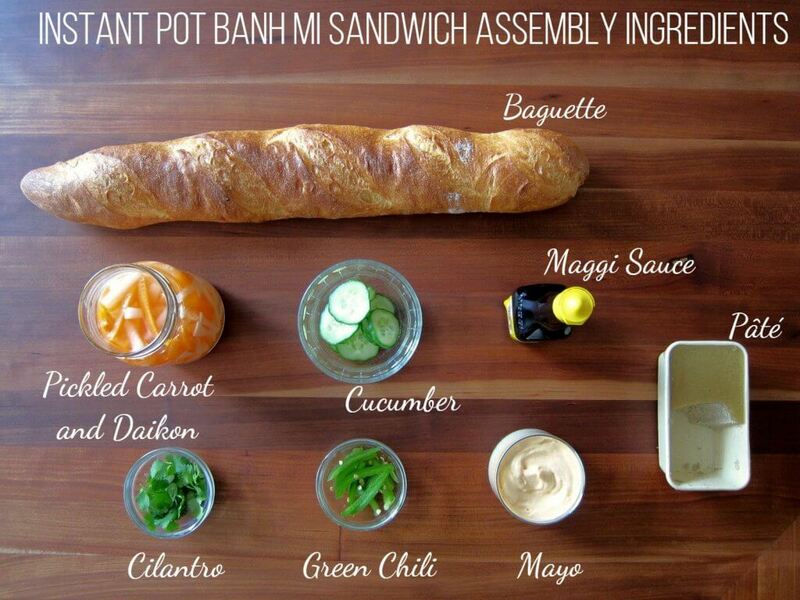 A few drops of Maggi sauce in the banh mi, when you’re assembling it, adds a lot of flavor. You can find Maggi sauce in Latin or Asian grocery stores. I use the Latin version. Read more about this sauce in Andrea Nguyen’s primer on Maggi sauce. If I don’t have any on hand, I use Golden Mountain Seasoning Sauce, which is a Thai sauce I use in noodle dishes. Daikon is an Asian radish and is usually available at regular grocery stores, but you’ll definitely find it in an Asian grocery store. (Warning: it’s got a very strong smell, especially if you store the pickle in a bottle!) If you can’t find it, omit it. Yet another ingredient that when combined with all the others, really enhances the flavor. I’ve provided a recipe for pickled daikon radish and carrots – it’s really simple to make. 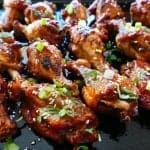 If you don’t eat pork, substitute bone-in chicken thighs and pressure cook them for 15 minutes with a natural release (NPR) and proceed with the recipe. 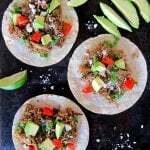 This recipe was made using a 6 quart Instant Pot Ultra. I haven’t had any issues with the Instant Pot coming to pressure with this recipe. However, if you experience the ‘burn’ message frequently you might need to add some extra liquid, e.g. some broth or water. 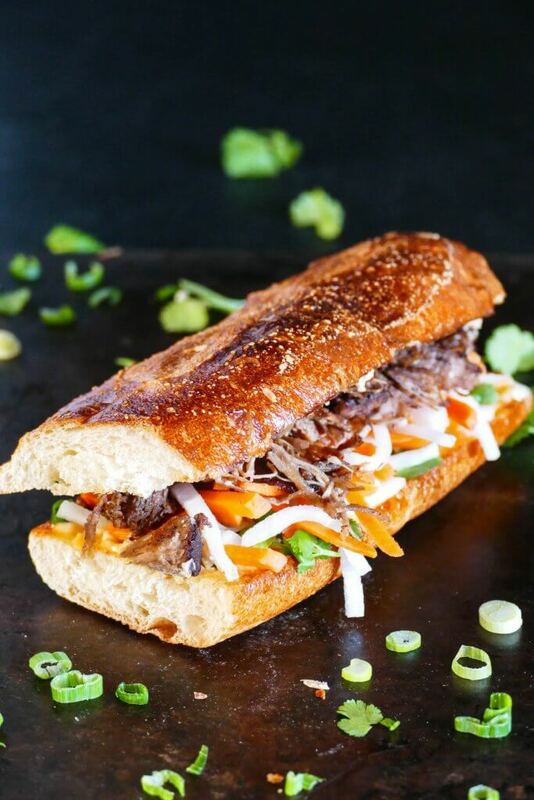 and aren’t familiar with how to use it, please read the Instant Pot DUO Beginner’s Quick Start Guide or the Instant Pot ULTRA Beginner’s Quick Start Guide first and then come back here to learn how to make this Instant Pot Instant Pot Banh Mi. Place pork in inner pot, pour marinade over meat and turn to coat. Press ‘Manual’ (or ‘Pressure Cook’) and ‘+’ or ‘-‘ until display reads ‘60′ (60 minutes). Select Pressure Cook mode and adjust time to 1 hour (01:00). The display will count down from 60 to 0; it will then switch to ‘Keep Warm’ mode and display ‘L0:00’ or ’00 00′ and begin to count up. Allow the pressure to release naturally (NPR). The float valve will be in the down position. This may take 15 to 30 minutes. Transfer the pork from the Instant Pot to a large bowl. Shred the meat using two forks, and remove any visible fat. Heat a large frying pan on the stovetop, add 1 Tbsp oil and allow to heat up. Cut a 6-inch piece of baguette in half lengthwise. Spread butter on the inside of both halves. Toast the bread on both sides on a griddle or in the oven. Spread a generous quantity of Sriracha mayo or mayo on one half of the baguette. Spread a generous quantity of pâté on the other half. Layer pork, pickled daikon and carrots on the bottom half. Drizzle a few drops of Maggi sauce, to taste. I sometimes substitute Golden Mountain seasoning sauce, which is a fabulous Thai sauce that I use on noodles. Layer cilantro, sliced jalapenos on top. Top with the other half of the baguette and serve immediately. Instant Pot Banh Mi is a Vietnamese Pork Sandwich that delivers an explosion of flavors. This Asian sandwich is assembled on toasted French bread or baguette with pork, pickled vegetables, and fresh herbs. Bring the flavors of your favorite banh mi food truck or takeout to your kitchen with this easy recipe. In a small bowl, mix lime juice, fish sauce, garlic, black pepper, Chinese 5-spice powder, and sugar. 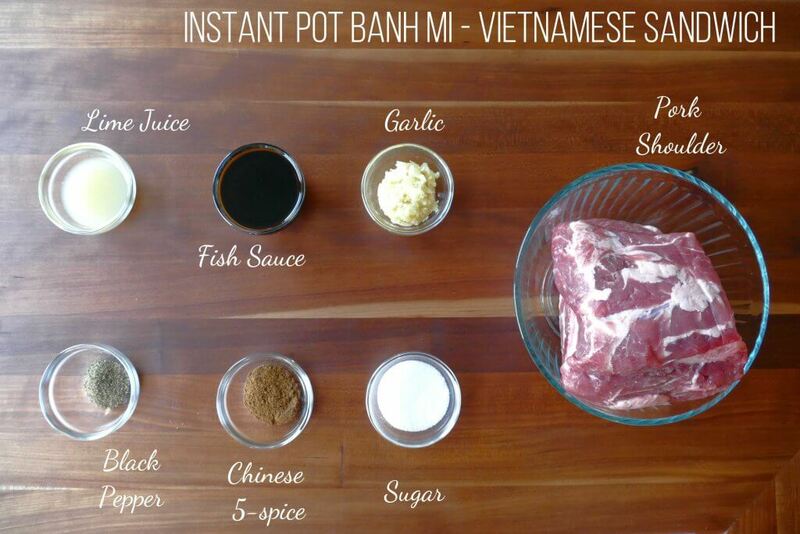 Place pork in Instant Pot inner pot, and pour sauce over meat and turn to coat. Pressure cook for 60 minutes. Allow the pressure to release naturally (NPR) and open the lid. Transfer the pork from the Instant Pot to a large bowl and reserve the cooking liquid. Heat oil in a large large nonstick frying pan on the stovetop. Toast the bread on both sides on a griddle or in the oven on a tray. Generously spread mayo on one half of the baguette. Generously spread pâté on the other half. Layer pork, pickled daikon and carrots, a few drops of Maggi sauce, cilantro, and sliced jalapenos on the bottom half. 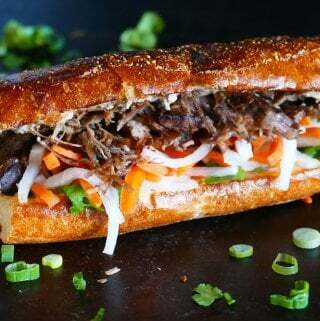 Top with the other half of the baguette and serve the banh mi immediately. Do you have a pate that you recommend for this? Hi Margarita – I didn’t have much of a choice – my store carries the brand Trois Petit Cochons. I have tried the pork pate and duck mousse – they are both very good. But I think you can go with any brand that’s available. I know Trader Joe’s carries a couple of brands. Made this tonight and it got rave reviews! I did make one small change, I had pork loin in the freezer I decided to use vs the pork shoulder. I marinated overnight and then cooked in the IP using a cup of chicken broth and 1/4 cup of fish sauce. Cooked for the recommended 1 hour and NPR. I was afraid it would be dried out but it was moist and delicious! I even skipped the browning and it was still delicious! My family is already asking for me to make it again. Thanks for a great recipe! That’s so awesome, Pam! It’s always special when I get my first comment on a post 🙂 ! I only post recipes I love, but I never know what people will think – will they like it as I do? Thank you for sharing your modifications, that will be useful to others. This sandwich turned out so yummy!! Thank you for the wonderful recipe! Thanks for your comment; I’m so glad you liked it, because it’s one of my family’s favorites too! for? Can’t wait to try this recipe! Hi Michelle, I would cut the pork shoulder into 2 pieces, and then you should be able to keep the cook time the same. You can either double the marinade or do what another reader did: she added some broth to the marinade, so you could add 1/4 cup of broth. Hope you like it. I don’t have any pork on hand…so I was thinking of trying to use chicken thighs. How long would you suggest cooking in the IP With this swap? Hi there Jules! Mmmm, I would say 4 minutes diced thighs, 9 minutes boneless thighs and 14 minutes bone-in thighs. Let me know how it turns out.